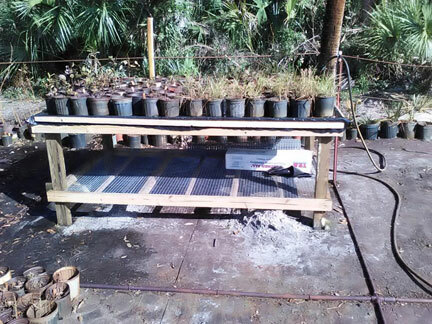 conservation, and restoration of the native plants and native plant communities of Florida. Sea Rocket monthly meetings are held on the fourth Wednesday of each month at 7:00pm (not the last Wednesday). Please email Lois Harris at lois6459@att.net for meeting information:. All Sea Rocket meetings and activities are FREE and OPEN TO THE PUBLIC. Sea Rocket Chapter serves north and central Brevard County from Scottsmoor to Rockledge and east to Merritt Island, Cape Canaveral and Cocoa Beach. REMINDER! The Sea Rocket Chapter does not meet in June, July and August; full programs resume in September. The purpose of the Florida Native Plant Society ~ Sea Rocket Chapter is to promote the preservation, conservation, and restoration of the native plants and native plant communities of Florida, primarily through education and community outreach. Monthly guest speakers provide programs on a variety of topics relevant to the mission of the Sea Rocket Chapter. Please view the current Sea Rocket newsletter for program information. Monthly field trips to conservation lands in central Florida are FREE and OPEN TO THE PUBLIC. View upcoming field trip information in the current Sea Rocket newsletter. Sea Rocket Chapter volunteers maintain a native plant nursery and sell plants to the public at events throughout the year; for information on volunteer work email Lois Harris at lois6459@att.net. Whew! The prototype water table has been completed. The table stands about 4 ft. high. It is 4 ft wide by 8 ft long, and 1 inch deep. The 1 inch is the allowed water level that will keep the plants moist. Why water from the bottom? The ground water we use at the nursery is full of iron. 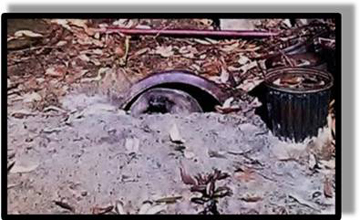 When we water the plants the iron deposits coat the leaves, cutting out the sun, thus killing the plants. By watering from the bottom the leaves will not get coated with iron oxide, and the plants will hopefully thrive. This table is a prototype to test the feasibility of following on with this method. 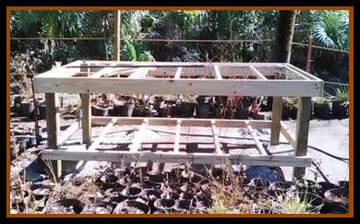 The table is level within reason, the plastic is solid, and the plants are drinking, as required. Today, 11-10-16, I saw "Nursery Nan" back in her burrow. I call her "Nan" because I've been told she is a girl tort. She was gone for a couple months but thankfully has returned. 4/16 The temperatures can get pretty high in the greenhouse, which is not good for the young and tender sprouts and rehabilitating plants the greenhouse is expected to house. We had shade cloth for over a year, but it too succumbed to the brutal Florida sun. Nothing we did seemed to tame the brutal heat built up in this structure. Sea Rocket abandoned use of the greenhouse idea. Eventually the County sold it and put in a storage building. 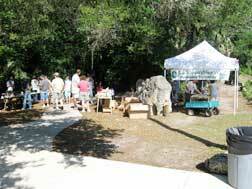 The Sea Rocket Chapter display and native plant sales at Earth Day Family Fun Festivals in Titusville's Enchanted Forest Nature Sanctuary. Click on the picture to see enlargements. 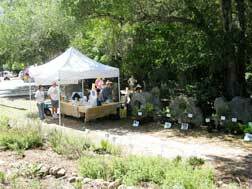 The Sea Rocket chapter of the Florida Native Plant Society is hosting the 1st Annual Florida Native Garden Tour in central and north Brevard on Saturday, 4/27, 9 am - 3 pm. Eight sites from Cocoa Beach to Titusville showcase Lagoon-friendly landscaping with Florida's native plants that also support birds, bees, butterflies and other pollinators. Tickets are available locally or online at Eventbrite (details on flyer). Tour locations and map: $10 if purchased locally at Rockledge Gardens or Growing Crazy; $11.26 if purchased online at Eventbrite. Kaylyn Palmer of KBB speaking on creating and maintaining a "Lagoon Friendly Lawn." Saturday April 24, 2019 — Social time begins at 6:30 pm. Meeting begins at 7 pm. April 6: Work day at the Enchanted Forest in preparation for the first Annual Garden Tour. Help us beautify the Butterfly Gardens to show off native landscaping ideas. GUIDED NATURE HIKES 10:00am the Enchanted Forest Sanctuary. Bring hat, water and walking shoes. Groups of 5 or more, please RSVP. For more information, please call 321-264-5185. Every Tuesday FNPS Sea Rocket Chapter Nursery Workday—9am-12noon, email Lois at lois6459@att.net for further info and schedule. Current activities are found in this month's newsletter. For a comprehensive view of Sea Rocket activities go to www.FNPS.org; events, "searocket." Volunteers are needed all the time to keep the nursery and gardens in top shape. If you think you'd like to be involved, but are new to native plants, no problem! I volunteered with zero knowledge of native plants and have been taught by the best about native plants and how to grow them. 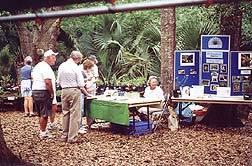 If you are interested there are opportunities to learn and be a part helping Florida regain many of it's vanishing plants. Volunteer opportunities exist for plant sales, or working the nursery, or helping to maintain the various butterfly gardens around the building.. Volunteering is a great chance to learn from the best, and meet and work with master gardeners, and experts in botany, and native plants, . Dr. Teresa Cooper is currently conducting research in the Enchanted Forest for the species Tillandsia utriculata. Webmaster: Tillandsia utriculata, commonly known as the spreading airplant, is a species of bromeliad that is native to Florida and Georgia in the United States. The Sea Rocket Chapter has completed an 800 square foot pollinator garden at Chain-of-Lakes Recreation Area in north Titusville. Keep Brevard Beautiful awarded the Sea Rocket Chapter a Xeriscape Grant earlier this year to help offset some of the costs associated with the garden. Sea Rocket's contribution to the project exceeded $1,800 in value and included over 140 hours of donated labor and nearly $500 in plant material. Volunteers planted 150 native plants representing 20 species, many of which are butterfly larval host plants. The two halves of the garden are split by a hardened trail, making it easy for visitors to view the many native pollinator species which visit the plants, including several species of butterflies, moths, and dragonflies. Chain-of-Lakes Recreation Area is located at 1614 Snowy Egret Drive. Contact Brevard County Parks & Recreation at 321-264-5105 for more information. Eileen Szuchy's "A Sampling of Native Edible Plants of the Central Florida Region"
Dr. Paul Schmalzer's "Scrub Habitat"
Dr. Paul Schmalzer's "Woodland Habitat"